Stinky breath--that is often what people think in regard to pet dental problems, but the roots (pardon the pun) of dental disease go much further. We perform an awake oral exam on every patient that will tolerate it as part of our physical exam. However, procedures such as dental cleanings and assessing the health of individual teeth cannot be done while the pet is awake. They are unable to comprehend what is happening to them. If people are frightened of the dentist even with complete understanding of the process, think about what it would be like for your pet. 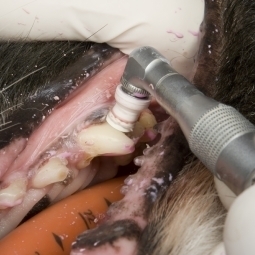 All of our dentistry is conducted while pets are under anesthesia. This allows us to do a thorough job that minimizes patient fear and discomfort. We are happy to discuss your pet's individual needs with you at any time.